The construction industry is one of the least receptive business to respond to technological innovation. Although there has been some progress as indicated by a recent 2018 Software Connect survey about SMB Construction firms in North America about their technology and software plans. The study showed that showed that 56 percent of its survey respondents are already using the best project management software for construction that’s a good fit for their business. But the move towards automation is not just limited to the project management aspect of construction. The industry is now slowly inching its way to what some people are calling the future construction – robotics. If you are wondering why robot appearances in the construction industry are rare because if you really think about it, it is one of the businesses that have a lot to gain from automation. The answer lies in the nature of the construction itself. Up until now, the robots that have been developed usually operate in a controlled environment doing repetitive tasks without any humans around them. A construction site is exactly the opposite of this. And, as of this writing, robots are still unable to adapt to the different variables that are present in a building site. To put it simply, robots are not yet intelligent enough to work seamlessly with their human counterparts in construction. 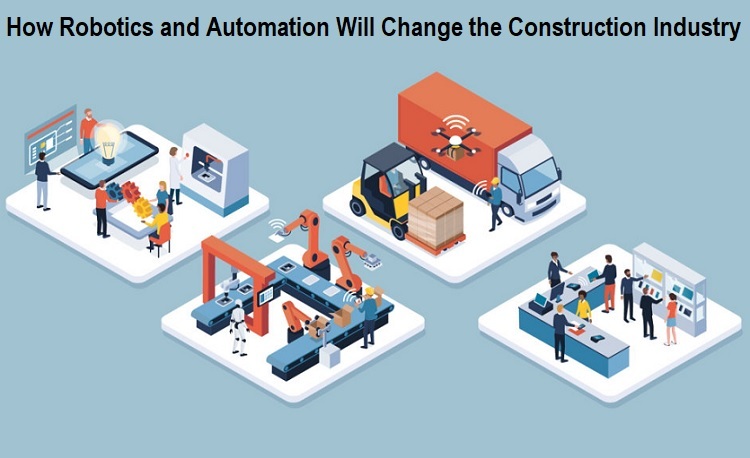 Although this is rapidly changing as new technologies are introduced, making construction robots safer, more intelligent, and are adaptive to change. Specialized robots can work in extreme conditions that are generally deemed unsafe for humans – minuscule, dark, stuffy places, or extremely dizzying heights. Using robots in these conditions can increase productivity without compromising safety. Robots can increase productivity and reduce costs in the long run. There is a robot named SAM 100 ( Semi-Automated Mason) which was designed by Construction Robotics that can lay between 300 to 400 bricks an hour compared to a human bricklayer who can only lay around 60 to 75 bricks an hour. Robots can help minimize construction-related injuries. Robotic exoskeleton or exo-suits can supplement human motion and allows more lifting strength without straining the muscles. This kind of exo-suits can help construction workers with repetitive tasks like bending down, squatting or even walking. With this type of robotics in construction, muscular overexertion will be a thing of the past. Traditional robots are robots that are controlled by a computer or some kind of on-site stimulus. These are autonomous robots that are usually used to build the framework of a construction project. These kinds of robots do one kind of repetitive job over and over. A good example would be a robotic drilling rig which is used to drill holes in concrete tunnel linings for Crossrail. Using a robot to do this job reduces safety risks as well as silica dust exposure which can be harmful to human health. Another example would be a Traffic Marshall Robot developed by PN Safety Industries which has a motorized hand movement to clearly indicate to cars that there is road work up ahead. Wearable robots are also called exosuits or exoskeleton. These type of robots are essentially a framework made out of metal and are fitted with what they call motorized muscles that are meant to multiply a wearer’s muscle strength. The way these are built very closely resembles a human's skeletal structure. This type of suit is made so that the wearer can lift heavy objects with ease, and in the process help reduce injuries. If you are having a hard time imaging how this looks like, think Tony Stark in Ironman. Because this is exactly what it is, although less dramatic. Exoskeleton in construction comes in different types depending on how it’s going to be used. For now, they have the mounted arm exoskeleton, back support exoskeleton, arm support limb, crouching and standing support and the whole body suit. As more and more companies are taking interest in producing wearable robots, and as prices for these kinds of robots continue to fall, it won’t be long before it will be a staple at any construction site. A robotic arm as the name implies is a kind of mechanical arm. This robotic arm is programmable to carry out functions that are similar to what a human arm can do. It can be a stand-alone robot or can be part of a more complicated robot. This kind of robot is already a staple in the car manufacturing industry but has just recently found its way in the construction industry. A Robotics company based in the Netherlands has successfully completed the world's first 3D printed steel in 2018 with the help of robotic arms which were coded so that it can control large welding machines. This 3D printed bridge is scheduled to be connected in a canal located in Amsterdam sometime this 2019. Will Robots Take Over Construction Jobs? Experts are realistically predicting that the robotics won't be a staple in the construction industry until about 20 to 30 years from now, depending on how technology progresses. But despite this, there is mounting fear among construction workers that one-day robots will be replacing their job, and they will be left in the dust. In fact, recent research carried out by the Midwest Economic Policy (MEPI) estimates that robots can replace 2.7 million construction jobs by the year 2057. There is no sugar coating it because the reality is that there will be jobs that will be considered obsolete. But for every job lost, 10 new kinds of jobs will crop up as robots and machines will need humans to program, and maintain it. Perhaps the best thing to do would be to look back during the industrial revolution when the T-model or the horseless carriage was first invented by Henry Ford. A similar fear gripped the people whose jobs relied on the horse carriage industry. But in the end, people adapted. Lots of jobs were lost, but new opportunities opened up to replace them. Change is a part of evolution, and technology is evolving our lives in a dizzying rate and it can be quite scary. But we do what we humans do best when faced with such a situation- we adapt.